How does spray foam insulation seal my home? How do Pipe Insulation in Houston Works? What is the difference in R Rating? When it comes to insulating your home, is it a very big decision and quite an investment to make yet a very important thing to do in order to have a well insulated home is to have a well sealed home. 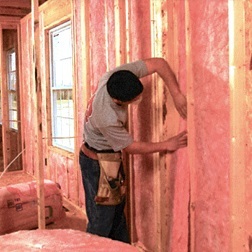 You hear of many different home insulation options on the market for example fiberglass, cellulose, spray foam etc. But what insulation method is really the best for your house? For starters, why does having a well sealed home matter? Well making sure that your home is properly sealed is extremely important because when you have a well sealed home, you stop convection heat transfer and maximize efficiency. Lets explain this further, there are 3 types of heat transfer; Radiation, Conduction & Convection. Of the 3 types of heat transfer Convection can account for up to 70% of heat transfer. Convection heat transfer is basically heat transfer by air movement. Its like a hair dryer, you turn on the switch, the electricity heats up the heating element and a fan blows air over heated element and transfers that hot air to your hair. That same effect happens in your home in a couple different ways. 1) External Air Transfer; this is when hot or cold air moves from the outside of your home to the inside of your home. 2) Internal Air Transfer; this is the movement of air from the inside of your home to the outside of your home. 3) In-Wall Convection; this is the unnoticed & unthought of heating / cooling bill killer. This can account for up to 20% of your homes heat transfer. The way this works is the walls of your home heat up in turn heating up the air in the walls. Hot air rises to the top of the wall hitting the top wall plate and transfers the heated air into or out of your home. When this happens it has to pull more air from the bottom of the wall and restarts the whole process over. It has been proven that spray foam insulation is the only type of insulation that effectively and properly seals the home and stops all 3 types of convection heat transfer. Bottom line is nobody wants a home that leaks air because all that it does is cost you higher energy bills month by month due to the high energy cycles performed by your cooling and heating systems. The areas where air leaks into and out of a home are often hidden from one’s view. Air leakage can be through holes, gaps, cracks, around window frames, around electrical boxes, pipe penetrations and many other areas. All these air leaks can cause an amazing 30-50% of energy loss. Besides the expense of utility bills, when a home is not sealed it allows for excess moisture and contaminants to enter and pollute your in-home environment. Proper sealing will reduce outside noise pollution, allergens entering and will greatly add to your overall home comfort.